The forthcoming Samsung Galaxy Note 3 could be thundering along at an almighty pace thanks to a new 3GB memory unit announced by the Korean company today. 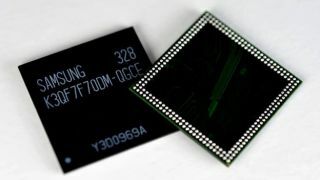 The company's new low-power LPDDR3 chip has now entered mass production with Samsung promising to slide it into devices during the second half of 2013. With the Note 3 heavily tipped for a pre-IFA arrival on Sept. 4, it wouldn't be too much of a stretch to suggest that famed phablet may be the first to benefit from the improvement in memory tech. Samsung has promised PC-like performance and a "generational shift" from the current 2GB packages, which resides within handsets like the Galaxy Note 2 and Galaxy S4 smartphone. Among the benefits, Samsung promises smoother full HD video streaming, faster multitasking and support for faster 4G LTE-Advanced data. The thinner chipset, built on 20-nanometer architecture, will also free up more space for larger batteries in slimmer phones, the company said, adding credence to reports suggesting the Note 3 will be more slender. "Three gigabyte mobile DRAM will be adopted in the most up-to-date, high-end smartphones starting in the second half of this year − an initial adoption that will expand to most high-end smartphones worldwide next year," said Young-Hyun Jun, executive vice president, memory sales & marketing, Samsung. As well the likelihood it'll appear in the Galaxy Note 3, that statement seems to confirm the Samsung Galaxy S5 will also boast 3GB of RAM. Samsung's next gen phones are going to have pretty sweet innards. Check out this new version of the Exynos 5 Octa eight-core processor.